The birdfeeder sways in the muggy breeze of summer's end with the same forlorn lack of purpose that overcomes a swing set in the February snow. It has been empty for months, innocent of any inkling that I once tried to murder a bushy-tailed rodent with cheese. 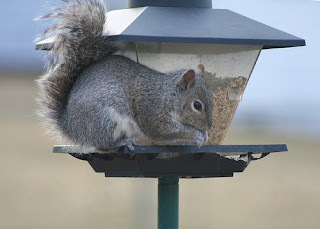 I didn't want the birdfeeder in the first place. It was a gift. But by the time I'd gotten out the ladder and a variety of tools to install a post on which it could hang, and after selecting a five-pound bag from a perplexing array of birdseed at Home Depot, it is safe to say I felt invested as never before in my local bird population. Anyone who has tried to feed birds knows the heartbreak of marauding squirrels. Suffice it to say, I tried every deterrent: a clear plastic shield the size of a garbage can lid, galvanized duct pipe wrapped around the pole and, finally, the Squirrel Baffler, a commercially available product that slowed him for a skinny minute. Then an old-fashioned remedy came to me: Shoot the squirrel. The .22-caliber pump-action pellet gun that my father gave me midway through the last century would do the job so silently that my neighbors would be none the wiser. But that notion ended in squawks of outraged protest when my family caught me measuring the distance across the back deck where I planned to plug the beady-eyed thief. So I decided to do him in with cholesterol. This came to me the morning after a party at which my horribly health-conscious friends avoided a fabulous platter of cheeses as though it were laden with hemlock. One fellow gave a soliloquy about how ripe cheeses went right to the arteries, steadily building to a fatal blockage. Squirrels have hearts too, I reckoned. It was all too easy at first -- a wedge of Muenster, a mound of Boursin, two chunks of Gruyere. For days, he nibbled away cheerfully. By week's end, the cheese supply had dwindled, and it dawned on me that funding a diet of brie for a squirrel was not sound economic policy. So, I switched him to butter. In two weeks, he developed a waddle. No longer so nimble, my squirrel fought for balance as he slurped the butter on the railing below the birdfeeder, which had gone unmolested for weeks. Then, as we sat at breakfast one Saturday morning, he heaved himself heavily to the railing, looking for his butter, but I'd forgotten to put it out. So he trundled down the rail, took aim at the birdfeeder and hurled himself toward the high end of the post. He missed entirely and flew over the railing, dropping 20 feet to the hard ground. I was overcome with fear that they were about to see a splattered squirrel. I reached the railing to find him glaring right at me, in the full flower of indignation and defiance. He backed slowly toward his tree, spewing squirrel obscenities all the way. So ended my war with the squirrel. "Hi! My name is Chris, and I'll be your server!" We are used to this, here in America. A waiter in a swank Paris bistro is never going to say, "Bonjour! Je suis Pierre, et je suis votre serveur!" But here in the melding pot of the Colonies we are all one big, happy precocious family, and a waiter must introduce himself by name. And always only a first name. Never a "Hi, I'm Mrs. McGillicutty, and I'll be your server." For years, we have resisted the impudent urge to respond to this faux familiarity by introducing everyone seated at the table: "Good to meet you, Chris, I'm Wilber from just down the road, and this is cousin Gertrude, who's visiting from Omaha, and right next to her, of course, is my nephew, Horace, and then there's his dad, whose Christian name is Dudley, but everybody just calls him Bud." No, we haven't done that, and we would have taken "Chris" in stride the other day had we not looked up and noticed his name tag. "If your name is Chris, why does your name tag say 'Peter'?" Chris -- or Peter? -- seemed startled until he glanced down to confirm our observation. "Well, we're required to wear a name tag and I forgot mine, so I picked the most American-sounding one back there" -- jerk of the thumb toward the kitchen -- "and it was Peter." "Yeah, all the others were, you know, were like, Carlos and Diego. 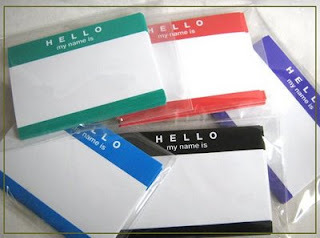 Like, look at me, nobody's going to believe me if I wear one of those. What am I going to do, walk up and say, "Hola, my name is Juan?" This was clearly a young man who saw virtue in maintaining the facade of credibility, so we thought to offer this advice: "Why don't you just tell people your name is Peter?" "Oh, no, I couldn't do that. I just have to be Chris." An Epiphany or a Revelation? Your pigeon is an ignoble bird, cursed with a flatulent warble where others sing, flapping madly to stay aloft while others soar, living in the concrete canyon of urban soot while others nest in forested grandeur. Not that any of this bothered me, mind you. I didn't give a hoot about pigeons until they came after me. For you to understand the whole of it, we first must discuss why people sing in the shower. It is because the sound of cascading water -- soothing, restful, uplifting -- makes them happy. Pigeons will not join you in the shower. But if you should install a pond no bigger than a bathtub and lovingly fashioned from quarried slate, your pigeon will not hesitate to stop by. As I sat sipping coffee to the satisfying gurgle of water from my new pond one morning, a chorus of warbles broke the spell. A row of pigeons leered down from the crown of my neighbor's roof. I suspected immediately that they had designs on my oasis, and closer inspection revealed evidence that they'd already been there. Pigeons I might not mind, but a pigeon-pooped pond will not do. The man at the hardware store said he had "just the thing" and disappeared into the back. The menacing plastic owl scared the tail feathers off those pigeons for a few days -- but only for a few days. "You gotta move it around!" said the guy at the hardware store. "Make them think it's alive!" So, every night I sneaked out after dark and moved the owl to a different spot by my pond. That fooled them -- but only for a few days. "I've got just the thing," said the hardware man. And he emerged from the backroom with a plastic falcon with talons the size of Brooklyn. The alarmed chatter from the rooftop the next morning put a smile on my face -- but only for a few days. The pigeons caught on. And they weren't very nice about it. I began alternating the owl and the falcon. I put them out together. I moved them around twice a day. I pondered buying a plastic lion, but it was four feet tall and cost $79.95. The man at the hardware store just shrugged, disappeared into the backroom and never returned. Then one evening I hit rock bottom. They had pooped on the owl and toppled the falcon into the pond. And they mocked me from the rooftop with snickering warbles. Had I been a better student at Sunday school, I might be able to tell you whether what happened next was an epiphany or a revelation. Returning despondent from another fruitless trip to the hardware store, I glanced toward the front lawn as I pulled into the driveway. There sat the scattered feathers of a pigeon who had been snickering when I left home. Standing majestically in the middle of the bloody mess was a real, live, honest-to-God falcon. It was the first falcon I'd ever seen outside a zoo. And if a beaked bird can smile, there was a grin on its face. I raced to my pond to fish out its plastic twin brother. As my avenger took wing, I placed the look-alike square in the middle of that sea of pigeon feathers. And I turned to confront my rooftop tormentors.